It takes a special individual to have the passion to care for our smallest patients as a nurse in a unit that’s unlike any other. Registered Nurses in the neonatal intensive care unit (NICU) at Cohen Children’s Medical Center are made for caring and protecting our patients and their families. It’s this commitment and heart of our nurses have bolstered Cohen’s reputation throughout the years. “I had always heard Cohen’s had a great NICU and that it was the “ultimate” place to work,” says Gina Forlani, an RN who jumped at the chance to join the NICU team at Cohen. As a Magnet® hospital with a level 4 NICU, Cohen’s nurses are known for delivering the highest standard of care to its many patients. Our nurses treat their patients with the individual attention they deserve, and this dedication that has earned Cohen a top 50 national ranking for exceptional care in eight pediatric specialties, according to US News & World Report’s 2018-19 Best Children’s Hospitals. 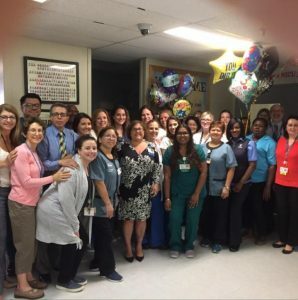 Cohen has also recently reached a a major patient safety milestone – the hospital has maintained a zero infection rate for central-line associated blood stream infections (CLABSI) in its 57-bed NICU for more than one year. Great leaders are just one of the reasons that a career in Cohen’s NICU is a career that grows with you. “It’s a great place to work in regards to work/life balance, furthering your education, and getting your voice heard,” says Brianna. Nurses within Cohen’s NICU gain gain invaluable experience and leadership skills, along with continued learning opportunities. And continued learning is a must in the NICU! Our nurses are constantly pushing Northwell’s value of being Truly Innovative. “We’re a Magnet hospital so there are always ways to be involved in improving care and making changes,” says Brianna, “It’s also important to keep an open mind and be willing to learn and discover. This is a rapidly advancing field and what we do today may be different tomorrow. Knowing the science behind your care helps to keep you informed!” By keeping our nurses trained on the latest technologies, such as a stabilization unit in the L&D, Northwell empowers them to redefine health care. Join the passionate and powerful team in the NICU at Cohen Children’s Medical Center. Explore job opportunities today!